Light, airy, rich - for crying out loud from the aroma - this should be a real cake, this can not be bought in the store! I will not be a long walk around the bush, following the recipe, as well as minor tweaks, which I hope will help you cook the most delicious cake. Sift the flour needed (ideally - a couple of times), it will saturate it with oxygen, which as a result will help the dough rise, make cakes lighter and airier. Cooking brew. Dissolve yeast in warm milk (not hot), add a teaspoon 1 sugar, 30-40 g of flour, stir until smooth. Cover with a damp towel and put in a warm place for 30-45 minutes. Tip: You may be able to warm up the oven (up to 50 degrees), then turn off, so it was not hot, but warm, to put the brew. After the specified time Opara should rise by about half. Prepare the dough. Melt in the microwave or on the stove butter, cool it, add a brew. There also add the ricotta, eggs, sugar, vanilla, salt, lemon zest / orange. Stir until smooth. There also send the remaining parts of the sifted flour, knead the dough. First, knead the spatula, then - on floured surface with bare hands. The dough will be very airy and light. Work with him 5-7 minutes, roll into a ball, place in a bowl. Again, cover with a damp towel and send it in a warm place for 1,5-2 hours. During this time the dough will rise well. Making cakes. In prepared (floured) surface of the dough should be carefully knead (10-15 minutes). Do this faithfully and always with love :) At this stage you can put raisins / dried cranberries / candied fruit and nuts if desired it. Forms of grease with butter and sprinkle with flour, put on the bottom of the parchment. Fill their test somewhere in the half. Put in a warm place to 40 minutes (dough should rise a little more). After bake-45 60 180 minutes at degrees. Willingness to check the wooden torch. If the tip starts to burn, cover it with a damp parchment. 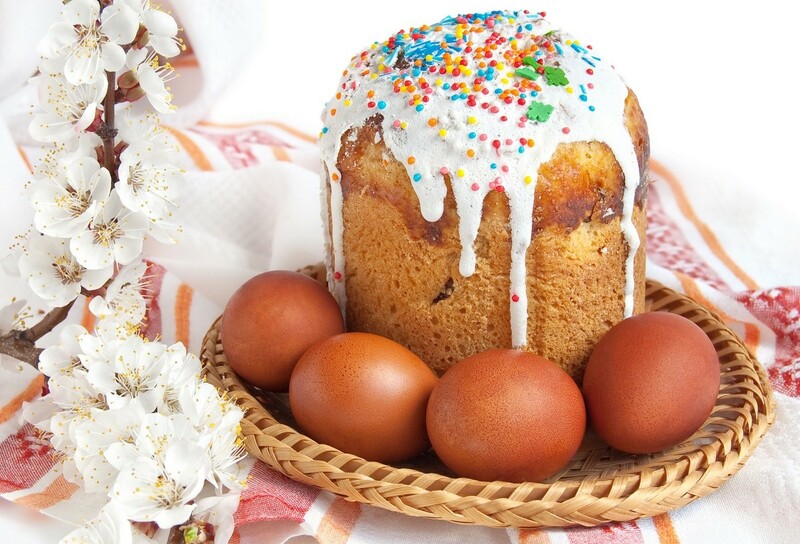 The most delicious Easter cake: NB! As for the dried fruit and candied fruit, they need to pre-wash and dry on a towel. Or, alternatively, soak for a few hours in warm water, adding a few drops of rum essence (or of this rum, amaretto). Icing sugar-protein. Ready cake can be covered with glaze. To do this, rub the rim protein 1, 220 grams of powdered sugar and a few drops of lemon juice, put on the cake evenly. Chocolate Glaze. Chocolate lovers can recommend the chocolate glaze: Melt in a water bath or in a microwave oven chocolate (plain or white - 150 g) portions to enter the warm cream or milk (~ 50 ml). Stir until smooth and smooth consistency (icing should be viscous, not very liquid and not thick). Pour the cakes.